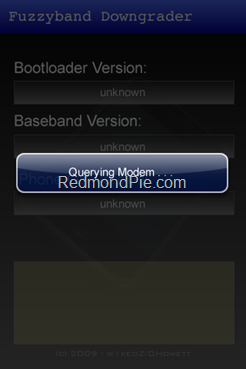 Fuzzyband has been upgraded to support the latest baseband 05.13.03 in iPhone OS 4.0 Beta. The following instructions will only help downgrade iPhone 3G which is currently on iPhone OS 4 Beta with 05.13.03 baseband and older bootloader 05.08. This wont work with iPhone 3GS. If your iPhone meets the above criteria, you can then use the latest version of Fuzzyband which supports iPhone 4.0 Beta to downgrade your 05.13.03 baseband to the older 04.26.08. Once you have downgraded your baseband, you can then use ultrasn0w to unlock your iPhone on iPhone 4.0 firmware. Here’s how you do it. Step 1: To downgrade your baseband from 05.13.03 to 04.26.08, you must first jailbreak your iPhone 3G running firmware 4.0 Beta by following the step by step guide posted here. Step 2: Once you have jailbroken your iPhone, Go to “Cydia” on your iPhone and Search for “Fuzzyband” and then install this application. NOTE: For those of you who don’t know your bootloader, simply run Fuzzyband and it will report the version number for you. Instead of updating it to make ir work for the 05.13.01, how about they update it for the boot loader 06.02 and 06.04? That's what all of us are having problems with…. So couldnt this be used to unlock 3.1.3? Upgrade to 4.0 then downgrade baseband then flash back to just 3.1.3 and leave hacked baseband intact? logically that makes a lot of sense, has anybody tried this? After my exams I'll try this out. It doesnt reboot after runing fuzzyband. I have 3g with 5.08 boatloader. Everything went well but it doesnt reboot after downgrading the baseband. The exploit that is implemented in FuzzyBand etc. isn't there in 5.9 onwards. Rather then wining about it either take a dump of your bootloader and find your own damn exploit or stop complaining. You dont own run the dev's life and some of us are grateful for the work they do. Those of us lucky to have the 5.8 bootloader are just that, lucky. My first 3g had 5.9 but when i got it swapped at an apple store the new one had 5.8.
mine reboots after the downgrade, but will not boot once i've installed Ultrasn0w. Exactly the same here. I did not make it clear there. but after installing fuzzyband and flashing it from 5.13 it now reboots to a recovery mode that not even itunes and recognize….. the boot loader is 5.08. whats going on? dear i hv 04.26.08 baseband can i update to 4.0 firmware my iphone 3g???? I just used ultrasnow 0.93 on my 3.1.3 iphone 3G with bootloader 06.02 and baseband 05.12.01 and it works perfectly! Finally got my iphone back!!!! !